Radioddity RD-771 DUAL BAND U/V SMA-M 10W Antenna For VX-8R VX-8GR VX-8DR VX-3R VX6R. Radioddity: GD-77,GD-77S. TYT QYT Leixen Car Radio. Walkie Talkie with. TYT: TH-F5 TH-UVF9 TH-UV3R TH-UVF8D TH-UVF9D;. brand new Length: approx. 21cm/8.26'' Frequency: 144 / 430 MHz Gain: 2.15 dBi Impedance: 50ohm Power resistance: 10W Interface: SMA Female Widely used on handheld Radios with SMA male interface Size: approx. 208*14*14mm/8.18*0.55*0.55'' Single weight: approx. 18g Quantity: 2pc. It does this by providing higher quality products at an affordable price, and backing that up with superior quality service. 📡 COMPATIBILITY: Compatible with handheld two way radios that need SMA-M antenna like Radioddity, Wouxun, TYT, etc. NOTE: Hello, my friend, w e provide five different c o l o r s FP761 SMA-MALE ANTENNA. Antenna type. Soft Antenna. Compatible for most radios needs (dual band sma-male antenna). The color in the pictures are for reference only. WOUXUN: KG-UVD1P, KG-816, KG-818, KG-819, KG-869, KG-889, KG-833, KG-659/E, KG-699, KG-669, KG-669plus, KG-689, KG-679, KG-659, KG-689plus etc…. BAOFENG: UV5R/Plus, UV5RA/Plus, UV5RE/Plus, UV5RB, UV5RC, UV5RD, UV3RPlus, BF-320, BF-480, BF-490, BF-520, BF-V6, BF-V8 etc…. Interface: SMA Female. Widely used on handheld Radios with SMA male interface. 2 x Dual Band Radio Antenna. Frequency: 144 / 430 MHz. Gain: 2.15 dBi. Power resistance: 10W. Single weight: approx. Size: approx. Connector: round 8 pin Female to 8 pin Female. 8 pin Mic microphone cable for Kenwood transceiver. TS-850 TS-870S TS-930S TS-940S TS-950S. TS-430S TS-440S TS-450S TS-660S TS-670S. 1x microphone cable. · Band: VHF UHF (2M/70cm). Fit model for handheld Radio · Frequency Coverage : 144/430MHz(120/150/300/450/800/900MHz reception only). Boost the signal of your radio significantly. · Length: 16-1/2" (420 mm). TNP antennas are individually tested to insure proper compatibility with your radio and frequencies! TNP Antennas are dependable, accurate, reliable and affordable. Avoid antennas that are not properly tested or tuned, which can cause high SWR and damage to your radio. TNP's are proven to be a reliable VHF/UHF antenna Extend the Range of Your Communication - Most TNP antennas will increase your radio's gain by 2.15 dBi or more. The longer the antenna is the better the antenna is capable of boosting weak frequencies. Shorter antennas offer more portability and convenience, while longer antennas generally perform better SMA Female Base Mounted - This series of TNP antenna's are SMA female meaning a perfect fit for many radios. Nagoya NA-805 Dual-Band U/V 144/430MHz SMA-F SF Antenna for Wouxun Baofeng UV-5R. 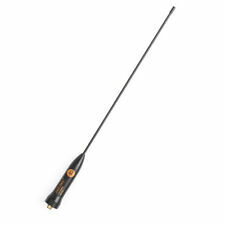 The Original Nagoya NA-805 Antenna will allow you to get longer range on your handheld radio, like BaoFeng UV-5R radio. Original WOUXUN UHF/VHF Dual Band Antenna for KG-UVD1P KG833 KG639E KG659E. Model: WOUXUN. WOUXUN: KG-UVD1P KG-816, KG-818, KG-819, KG-869, KG-889, KG-833, KG-659/E, KG-699, KG-669, KG-669plus, KG-689, KG-679,KG-659,KG-689plus etc…. WOUXUN: KG-UV6D UV8D UV9D. Original WOUXUN Antenna KG-UV8D SMA-Male 144/430MHz Two-way Radio Walkie Talkie. Antenna SMA-M Male VHF/UHF Wouxun KG-UV6D/8D Radio. -1PCSWouxun KG-UV8D Antenna. Impedance: 50 OHM. Wouxun handheld Radio : KG-669 ,KG-669 Plus,KG-659 KG-679,KG-679plus,KG-689 KG-689plus. BaoFeng Radio: UV-5R, UV5RA, UV5R Plus, UV-5RE, BF-888s. Antenna Length: 51CM. Max power : 20W. Enjoyable for all ham. WOUXUN: KG-UVD1P, KG-816, KG-818, KG-819, KG-869, KG-889, KG-833, KG-659/E, KG-699, KG-669, KG-669plus, KG-689, KG-679, KG-659, KG-689plus etc…. PUXING: PX-777, PX-666, PX-3288, PX-555, PX-666, PX-888, PX-6288 etc…. ⊙ HYT TC-268, TC-268S, TC-270, TC-270S, TC-368, TC-368S, TC-370, TC-370S… etc. ⊙ WOUXUN KG-659, KG-679, KG-669, KG-689,KG-699, KG-801, KG-703, KG-UVD1P. ⊙ Linton LT-2288, LT-3288, LT-6288,LT-5288, LT-3188, LT-2188,LT-2268,LT-3260, LT-3268 ,LT-6188. Compatible Models: For BaoFeng/Pofung Handheld Radio: DM-5R, UV-5R, UV-5RA, UV-5RB, UV-5RC, UV-5RD, UV-5RE, UV-5RA , UV-5RE PLUS, UV-B5, UV-B6, BF-888S, BF-777S, BF-666S, UV-82, UV-82C, UV-82HP, UV-82L, UV-82X, UV-82WP, UV-82 V2 , UV-5RTP, BF-F8HP, BF-F8 , BF-F9, UV-5R Plus, UV-5R V2 , UV-6R, FF-12P, UV-5X, GT-3, GT-3TP, GT-3WP GT-5, GT-5TP, 997-S, BF-F9 V2 , UV-6, UV-8D, UV-R5H, UV-5R5, UV-5X3, A52, UV-3R Plus, R760, BF-9700, etc. For HYT Handheld Radio: TC-268, TC-268S, TC-270, TC-270S, TC-370S, TC-500, TC-500S, etc. For Linton Handheld Radio: LT-2288, LT-5288, LT-2188, LT-2268, etc. For PUXING Handheld Radio: PX-777, PX-666, PX-3288, PX-888, PX-888K, PX-328, PX-333, PX-999, PX- 555, etc. For WOUXUN Handheld Radio: KG-UVD1P, KG-UV2D, KG-659, KG-679, KG-669, KG-689 etc. The Original Baofeng Antenna will allow you to get longer range on your handheld radio, like BaoFeng UV-5R UV-82 GT-3 radio. Baofeng BF-88A/88E. Model: Baofeng BF-V85. WOUXUN handheld Radio: KG-UVD1P,KG-UV6D,KG-659, KG-669, KG-669 PLUS, KG-679, KG-679 Plus, KG-689, KG-689 PLUS, KG-699E. TYT,QUANSHENG ,WEIERWEI,BAOFENG …etc. WOUXUN : KG -659, KG-679, KG-669, KG-689, KG-699, KG-801, KG-703, KG-UVD1P …etc. LINTON : LT -2288, LT-3288, LT-6288, LT-5288, LT-3188, LT-2188, LT-2268,LT-3260, LT-3268. 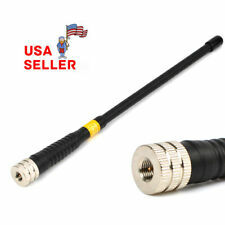 $Frequency: Dual Band 145/435MHz Type: SMA Female Length: 14.4". Radioddity RD-771 DUAL BAND U/V SMA-M 10W Antenna For VX-8R VX-8GR VX-8DR VX-3R VX6R. Radioddity: GD-77,GD-77S. TYT QYT Leixen Car Radio. TYT: TH-F5 TH-UVF9 TH-UV3R TH-UVF8D TH-UVF9D;. WouXun: KG-UV6D, KG-UV8D;. WOUXUN : KG -659, KG-679, KG-669, KG-689, KG-699, KG-801, KG-703, KG-UVD1P …etc. Fit model for handheld Radio TYT,QUANSHENG ,WEIERWEI,BAOFENG …etc. ☉ Impedance: 50 Ω. PUXING : PX -777, PX-666, PX-888, PX-3288, PX-999, PX-555, PX-728…etc.